Previous post: Best “Silent Night” ever. 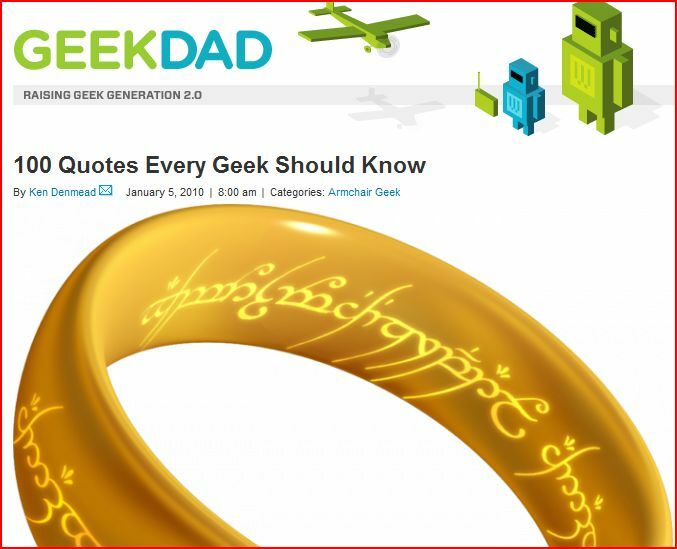 From “100 Quotes Every Geek Should Know,” via Wired News. My favorite geekline not included: “I might as well be wearing a red shirt!” – some guy on some episode of Stargate SG-1. I always loved that Sam Raimi reused “Klaatu brada nikto” in “Armies of Darkness”. Thanks for this post. Great first cup of coffee reading. Some of them missed the mark for me for quotes from the same movie. I’d have chosen the land war in Asia quote over the Sicilian, for instance, in The Princess Bride. And where’s “May the Force be with you?” I’m not sure it trumps “I’m sorry, Dave”, but “My mind is going. I can feel it.” stuck with me more powerfully. I definitely agree with you about the Star Trek quotes. I still crack up thinking about the parking quote. And the other one is so emotionally powerful. Star Wars; ObiWan Kenobi: “Mos Eisley spaceport: You will never find a more wretched hive of scum and villainy. We must be cautious.” Every one of my sons will recite this correctly given the opportunity. Sometimes substituting the location if appropriate. And who is the toughest guy on Star Trek? Scotty … The only red shirt who didn’t get killed. Think about it.